This section is dedicated to my Baby Bell. Watch her as she grows and becomes just like her father. Okay, maybe not just like her father, but hopefully you can see her develop into a wonderful person that has a positive contribution to society. No pressure! Even though most parenting advice websites say to feed your baby from the bottle for the first 6 months, we decided to give spoon feeding a go at around 4 months. It's fun to watch how Baby Bell reacts to the different food flavors when tasting them for the first time. The look on her face is priceless. 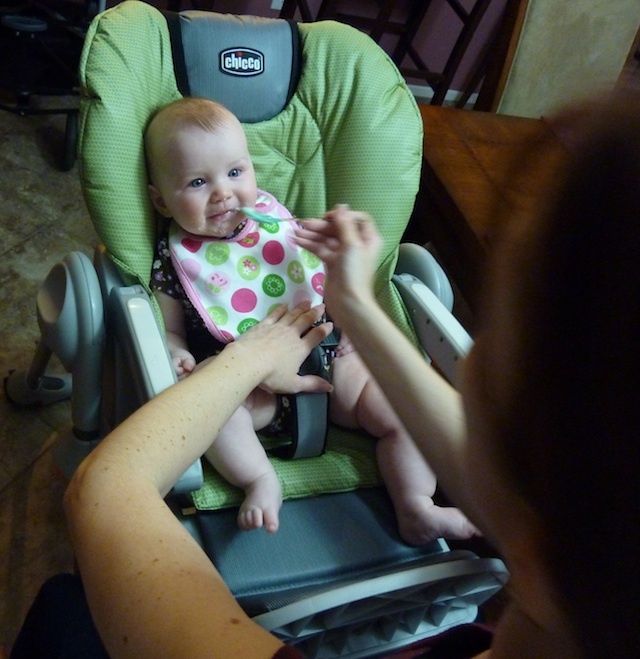 Other than some crying the first time we offered her food from a spoon, she's adapted very quickly and enjoys getting her dinner via this method. It sure does help her sleep well at night. Fortunately, she hasn't experienced any food allergies while enjoying a variety of foods including rice cereal, peas, green beans, bananas, peaches and now sweet potatoes. Not that you care much what Baby Bell is eating, but as a parent, it's hard not to share something so cute with the world. Hope you enjoy as much as she does! Now thatÂs sbtule! Great to hear from you.